Balluderon, St Martin's Stone, Pictish cross-slab. View of St Martin's Stone, cross-slab, fragment. The Balluderon cross-slab. 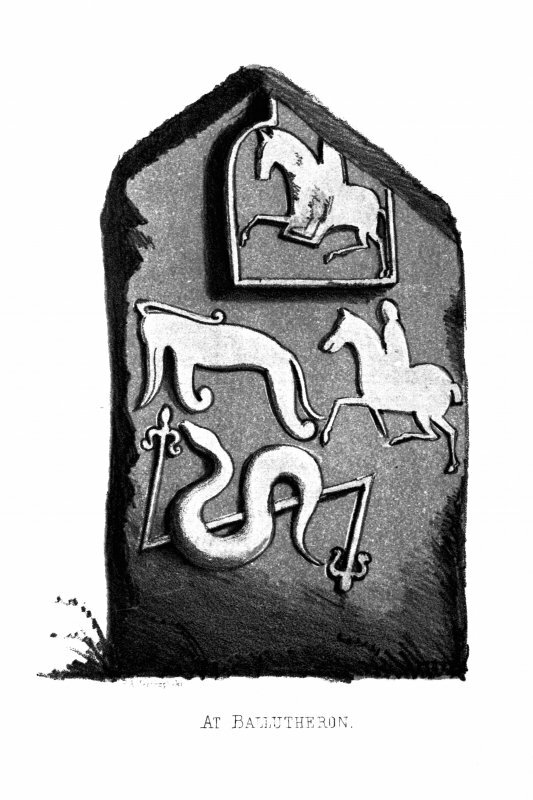 From J Stuart, The Sculptured Stones of Scotland, vol. i, 1856, pl. lxvii. 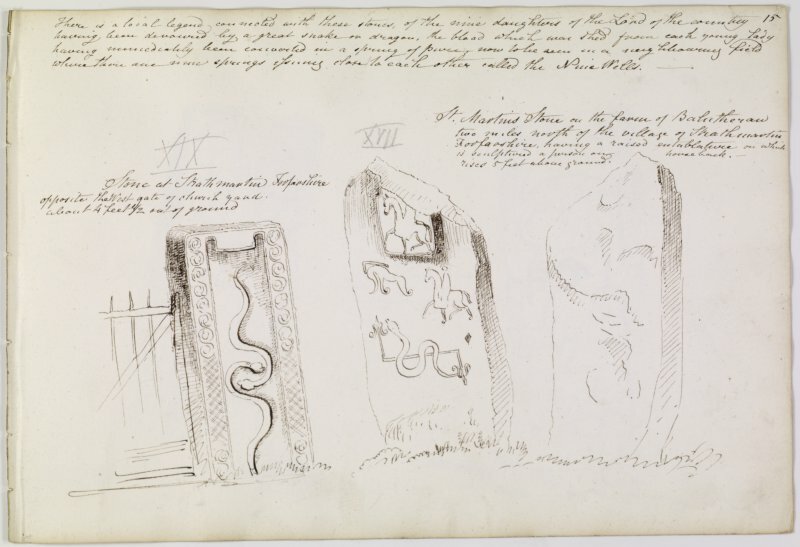 Annotated drawing of the Strathmartine recumbent grave-slab (no 2), and the reverse and obverse of the Balluderon cross-slab. From the James Skene sketch album, page 15. Evidence for discovery: first recorded around 1832. Present condition: weathered and missing its top portion. This is the lower part of a cross-slab, which is carved in relief with a flat-band edge and the base of a cross outlined by a roll moulding. The base contains a rider and horse facing left: the horse is trotting and its right foreleg extends into the frame moulding. The rider is sitting on a saddle cloth, beneath the cross-base on the right is another horse and rider in similar pose, and here the rider is clearly wearing a small circular shield. 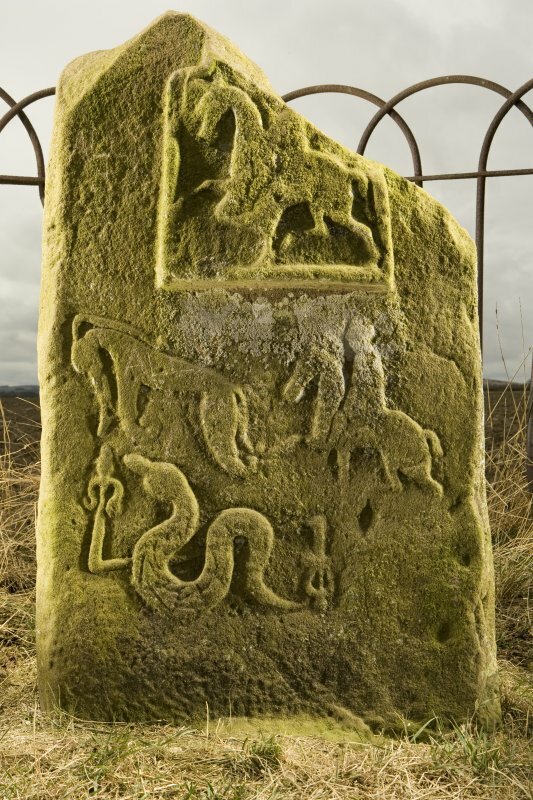 In front of him is a Pictish beast symbol, below which is a serpent and Z-rod symbol. Primary references: Skene 1832, 15; ECMS pt 3, 215-16; Fraser 2008, no 55. 'Martin's Stone': a broken cross-slab standing within an iron fence, is as described and illustrated. Martin's Stone is an upright cross-slab (Class II) 4' high by 2'3" wide, sculptured in relief on one side. Measuring 2m x 0.68m x 0.17m, it is of sandstone and is broken away at the top. On one face the lower end of a cross-shaft bearing a horseman, the elephant, serpent and 2-rod symbols and a second equestrian figure are carved in relief. Visited by R Jones, 1980. Class II symbol stone. 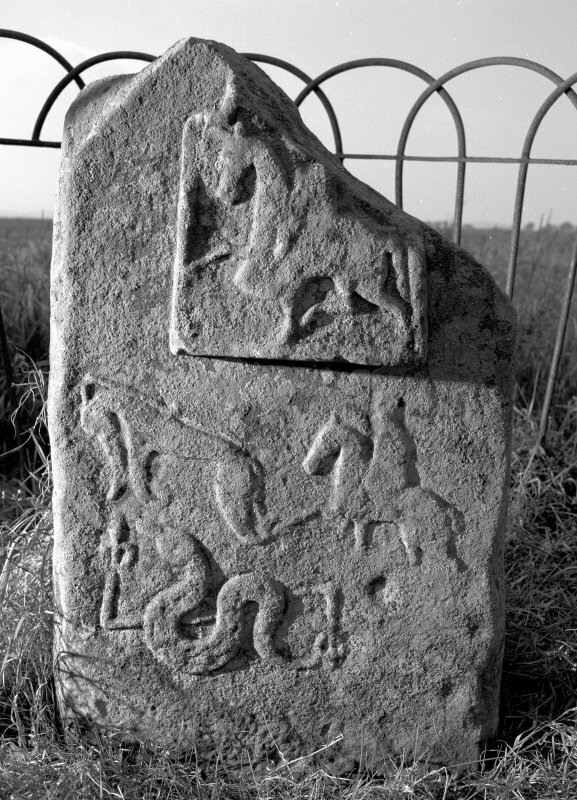 On the east face are part of a cross with two mounted figures beside which is an elephant over a serpent and Z-rod. 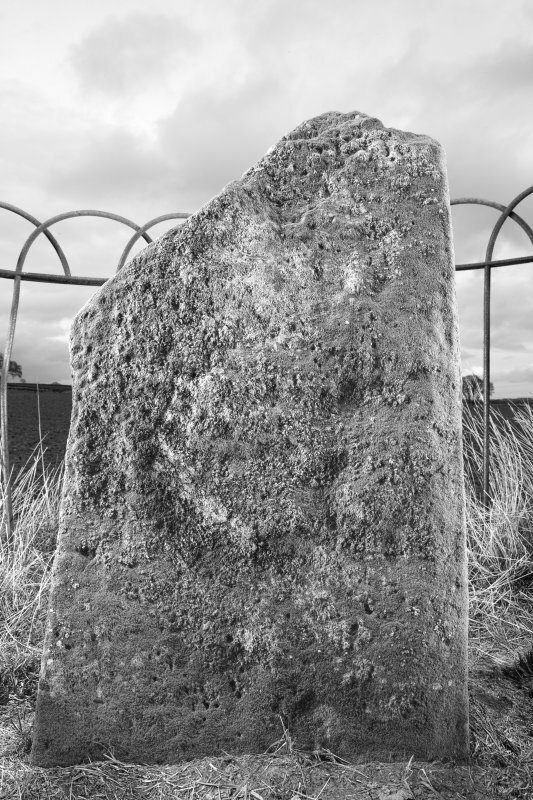 The monument comprises a Pictish cross-slab dating to the second half of the 1st millennium AD. 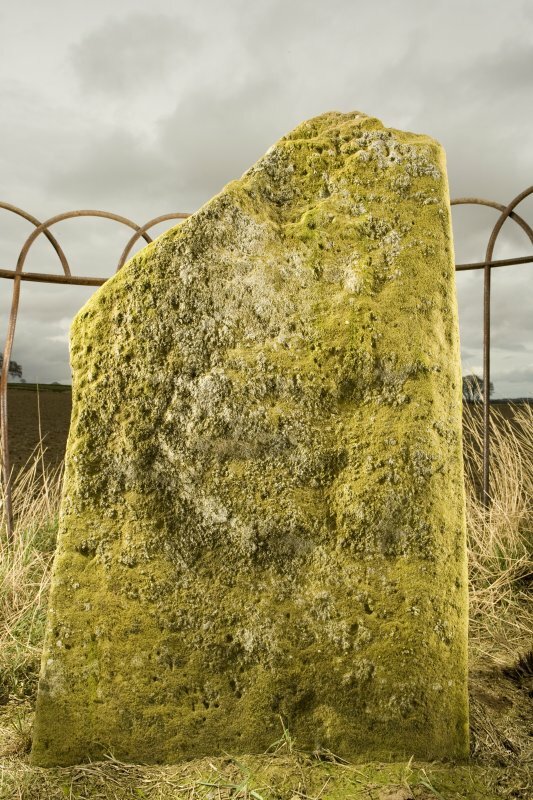 It stands, within a small railed enclosure, in an area of arable farmland, at around 150m OD and comprises a sandstone slab measuring about 2m high by about 0.7m wide and some 0.2m in thickness. Information from Historic Scotland, scheduling document dated 7 December 1998.